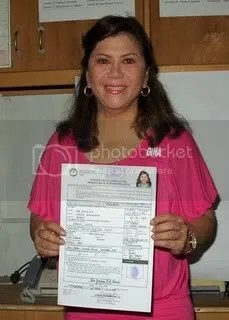 DAGUPAN CITY – Gina de Venecia, wife of former Speaker Jose de Venecia, filed her certificate of candidacy for fourth district of Pangasinan at the Commission on Elections provincial office. Ms. De Venecia was also appointed district chairman of the Nationalist People’s Coalition, the couple’s new party. The former speaker’s wife was accompanied by 140 barangay captains of the district, her son Christopher, her mother Nene Vera Perez, and sisters Lilibeth Napkil, Marichu Maceda and Chona Ampil. 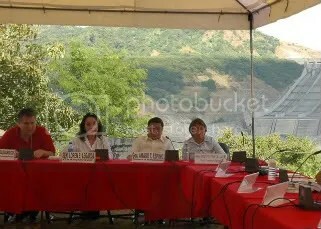 The Senate Committee on Climate Change, chaired by Senator Loren Legarda, held a public hearing in Barangay San Roque, San Manuel, Pangasinan in a spot overlooking the spillway of the mammoth San Roque Multi-purpose Dam last November 25. Attended by Governor Amado T. Espino, Jr., Vice Governor Marlyn Primicias-Agabas, Congressman Mark Cojuangco, various local chief executives, officials of San Roque Power Corporation (SRPC) and the Napocor, representatives of different government agencies and non-government organizations, the hearing specifically sought what transpired during the massive flooding in the province at the height of Typhoon Pepeng. Opposition Senator Chiz Escudero said that the massacre in Ampatuan, Maguindanao was rooted from the inability of the Armed Forces of the Philippines and the Philippine National Police to protect civilians. “It’s a reality that the military and the police cannot protect civilians. Civilians more often than not are left to protect themselves in some parts of Mindanao ,” he said during an interview over the ABS-CBN News Channel (ANC). 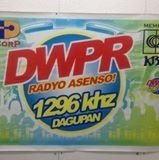 Escudero blames the insincerity of law enforcement officials in enforcing gun permit laws. He said that the next administration should make sure that the laws are being followed. He said that if a civilian carries firearms without any permits, then he should be prohibited from holding a gun. “If you are not a soldier or personnel in uniform, you have no business carrying a gun,” he said.